My Marine and Me: First Giveaway! Introducing Allie's Fabulous 100 Follower Give Away! I have to say thank you first of all. When I started this blog last year, before Ryan deployed, I never expected this. This being the amazing group of women I have had the chance to meet and get to know. I am astounded everyday by your stories and generosity and that is the reason I wanted to try and give a little something back. Thank you following, for blogging, and for stopping by. I never thought this thing would get as big (and I no compared to some it isn't that big!) as it has or that it would become to important to me and my life as a Marine Wife. In Joan's own words, "Perfect gift for that special military person/family member in your life. My husband is a Marine and I am always on the lookout for military fabric. 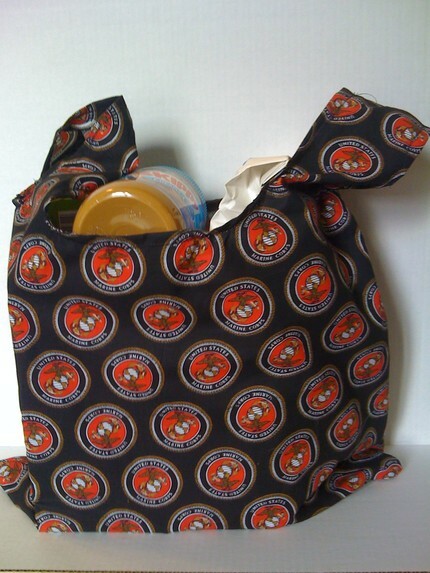 This brand new with tag, reusable handmade in USA grocery bag is 18" wide, 20" deep from the top of the strap to the bottom of the bag. It is 15" from the bag opening to the bottom of the bag. It is a high quality fabric, well constructed with triple stitching on seams. It is easy to take care of, machine wash and dry. The fabric is prewashed so there will be no shrinkage. Pay tribute to our armed forces, a friend or just because. Invest in your reusable grocery bags. You can make a difference in our environment. These reusable 100% prewashed cotton bags are also available in Navy,and Army fabric. If you are looking for another branch of the military, something for a hunter or outdoors person let me know. We will be launching many new items as we develop our store." 2a. If someone comments saying they heard about the entry from your blog. 2 entries! 4. Promote Joan's shop on your blog and link it up! 2 entries. 5. Post about the giveaway or Joan's shop on facebook/twitter and link it back here. 3 entries. Ok, I think that sounds about right. I will be accepting entries until Monday October 4th. I will post a winner (randomly chosen) after that! Love this! I follow you and of course would get Marine fabric! I follow you and would choose the Marine fabric of course! I have this fabric, I just haven't gotten around to using it for much! I am a followers and would love the marine corps fabric! I am a follower! I would love this in Navy fabric! I totally missed this post yesterday!! I am a follower and I would choose Air Force as my husband was in the Air Force and my sister is currently serving. i'm a follower already and i'd go with the army fabric! You might have to add me as a friend but I facebooked about Joan's Etsy shop and your giveaway. I'm a follower! I would absolutely LOVE the Marine Corps fabric!! I am a follower! I would choose an AF theme fabric! I'm a follower and of course if I won I would pick the Marine fabric! I just became a follower:) I'd choose Navy fabric!